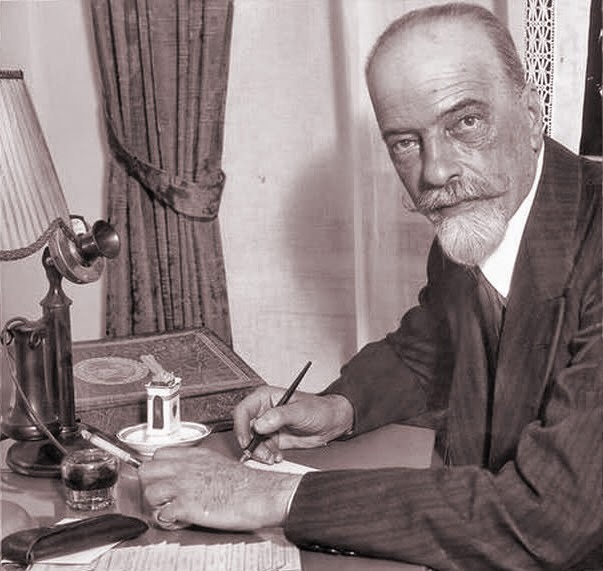 The Grand Duke Alexander Mikhailovich (“Sandro”, 1866–1933) was opportunely positioned to have an opinion in depth about the Tsar and the immediate prewar situation in Russia. Not only was he an admiral of the Imperial Russian Fleet who served during the Russo-Japanese War, he was also instrumental in bringing military aviation to Russia, having followed flying pioneers since Santos-Dumont’s accomplishments in the early 1900s. 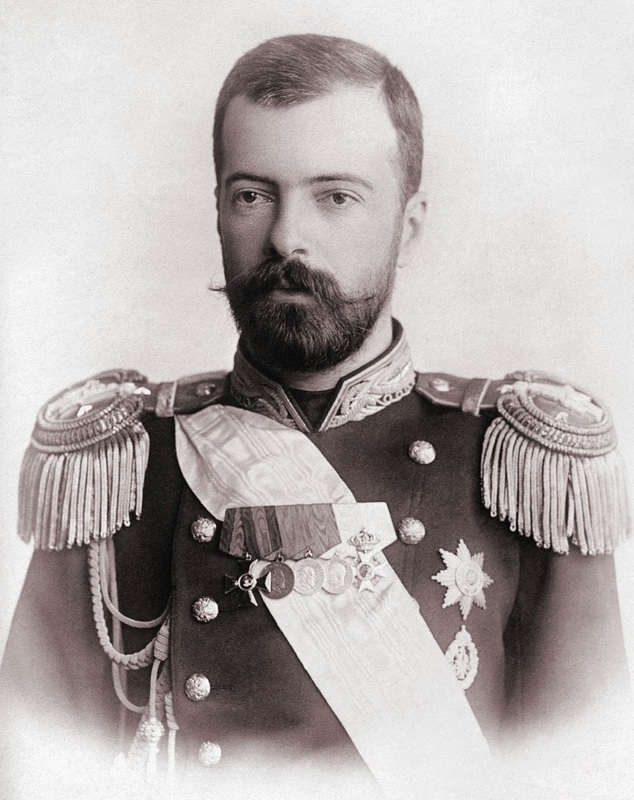 In addition, Grand Duke Alexander was both cousin (Sandro and Nicholas’s father, Tsar Alexander III, were first cousins) and brother-in-law to the Tsar (his wife was Nicholas’s sister Xenia), enjoying a long, close relationship with Nicholas until the politics surrounding the Empress Alexandra and Rasputin caused a deep rift between the Grand Duke and the Empress during the war. Emboldened by Louis Blériot’s pioneer crossing of the English Channel in 1909, the Grand Duke met with him and Voisin to establish contacts that would further military aviation in Russia. By 1912 Grand Duke Alexander had created an aerodrome and flying school in Sebastopol, where the mild weather favored year-round flying, and had the nascent Imperial Russian Air Service join the army maneuvers of 1912. He held command of the Imperial Russian Air Service in the Great War until 1917. His IRAS was headquartered in Kiev in 1916, in support of the Brusilov offensive. The revolution saw him and his family exiled to their estate, Ai-Todor, in the Crimea, where they spent more than a year under Soviet detention, until the German occupation of the area after the Treaty of Brest-Litovsk, which proved good fortune and their salvation. The Grand Duke was evacuated in December 1918 by the British destroyer HMS Forsythe to attend the Paris peace conference as the representative of the Romanov family, and his family followed in April 1919 on HMS Marlborough. Throughout the 1920s, spent mostly in France, the Grand Duke sought ways to support his family and to come to terms with their new life. Initially they bought three years by selling his wife’s pearls. In 1925 the Grand Duke was invited to Abyssinia by the Emperor and spent six months there under the auspices of being the Emperor’s emissary to induce the Armenian clergy to return an ancient convent in Jerusalem to Abyssinian control; such was the enduring belief in the power of even a dispossessed Russian royal to exert influence in a changed world. The Grand Duke toured the United States in 1928 on a lecture tour the theme of which was “Happiness in Poverty”. He had found peace in his writing and living post-revolution, producing several volumes of memoirs, magazine articles, a historical novel based on Catherine the Great, and a book on the lives of exiled European royals, Twilight of Royalty. 1. The conflict was caused by the Anglo-German rivalry for the economic supremacy of the world and by the combined efforts of the military cliques of Berlin Vienna, Paris, London and St. Petersburg. Had it not been for the assassination of the Archduke Franz-Ferdinand, another pretext of equally abysmal cynicism would have been chosen by the international champions of war. Kaiser Wilhelm naturally wanted to “have it over with” before the completion of the Russian Military Program in 1917. 2. Nicholas II did all in his power to prevent the outbreak of hostilities, finding but little, if any, support for his conciliatory efforts among his advisers of the Russian Foreign Office and the Russian General Staff. 3. Up to the stroke of midnight, July 31, 1914, the British Government could have averted the catastrophe, had it declared its readiness to stand by France and Russia. A simple declaration made to that effect by Herbert Asquith or Sir Edward Grey would have pacified even the most belligerent Junkers in Berlin. The “Belgian alibi,” advanced by the British Government three days later, made up in human appeal what it lacked in cool logic. The British Empire went to war not because of its holy respect for the inviolability of international treaties but on account of its bitter feelings toward Germany. Were Herbert Asquith less of a lawyer and more of an outspoken humanitarian, no war would have been declared by Germany on August 1, 1914. All other “ifs” exploited by the historians of 1914 are fanciful and meaningless. We might just as well go back to 1912 and ask ourselves what would have happened to the world if the Republican National Convention in Chicago had nominated Roosevelt instead of Taft. Possibly, the United States would have joined the Allies on May 8, 1915, the morning after the sinking of the Lusitania; more likely, however, Mr. Roosevelt would have recalled the American ambassador to the Court of St. James’s long before that date, as a protest against British interference with the eastbound movements of American merchant ships. Wow! As a Brit, I read paragraph 3, and think "ouch"! But I wonder if paragraph 2 reflects his own loyalties. The Grand Duke exhibited noble traits that I associate with the nobility: being and exhibiting the essence of the national character; honor; deporting oneself well with the demands of the occasion; charisma, patrician, the natural aristocracy. Clearly he had these qualities, and deserved his and his family’s good luck in escaping the Bolos. He seems to be an honest man eking out a living as best he could, I would like to know more on what his exiled life style was? His “Twilight of Royalty”, as well as “Once a Grand Duke” may be a good read, which I will keep my eyes out for. His “three facts” from the 2nd cited work have the ring of truth, although I need to work on my familiarity with Britain’s entry into the fray to comment on #2. I also agree with Adrian Roberts in wondering if #2 was a reflection of his own loyalties. His comments on Teddy Roosevelt likewise pique my curiosity and interest. Also I would like to now more of his Abyssinian adventure. Thank you for contributing this most interesting piece. Parnelli — The Grand Duke's Abyssinian adventure is described in the second volume of his memoirs, Always a Grand Duke. Good read, especially on the mixed fortunes of post-revolution Russian royalty and aristos. I found photo of family from Bates County Museum in Missouri, which showed the three men at Queen Victoria's family reunion Andre sitting, Philip standing on left, Rudolph on right. Same men later in life in "Coal Miners of Rich Hill Missouri" photo they were my great grandparents. Never knew until my genecology. 8,500 family exist now.